Next postGalicia and Asturias – Where You Could Never Go Hungry! You lucky thing – when i lived in London I never had to think about where I could get my next “fix”…now I have to plan ahead! 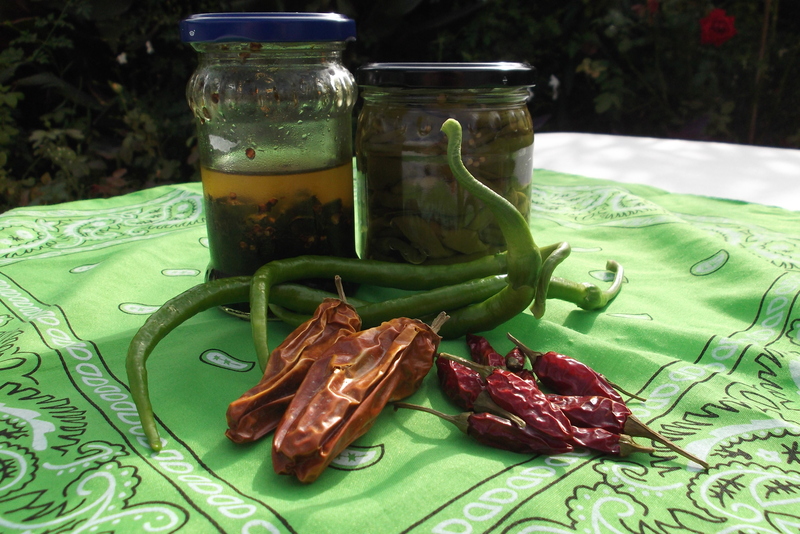 I love chilies – I wish I had a garden to grow them in. Have a great trip – hasta pronto! They grow quite well in pots – not to the same height as in the garden, but not too bad. Thanks for the good wishes…am so looking forward to this trip! This is one time that you shan’t tempt me to follow your lead. I like a little spice to my food but not nearly enough to can chilis or use them to infuse oil. I’ve considered growing my own, however, because my parrot loves chilis, the hotter the better, and it’s one sure way of giving her organic food. Never mind her. I really stopped by to wish you a great holiday! Get some rest, eat well, and enjoy yourselves! I love that your parrot eats chilies! My chickens do sometimes (inadvertently) – can be quite explosive! Thanks for your kind words and looking forward to catching up with your posts later in the week. Have a great holiday! These look fantastic. I dry mine, but haven’t tried pickling and really should. Even if just for visual pleasure, chilli plants always prettify a garden. Have a fantastic holiday and looking forward to hearing all about it when you get back. Forgot about chilli vodka – must do some of that and I like the idea of a chilli/sherry dressing. Thanks! Thank you – I should be packing right now! I just checked out your post – your godparents sound great! Wow… you can have mine! I don’t do that kind of heat… for some reason it just doesn’t make me happy at *all*. But it sure is pretty in your photos! Enjoy! Your chilis sound great preserved that way. I have been keeping mine in the freezer and will give your method a try. The flavorful oil will be great also. I know that you will have a lovely holiday and can’t wait for you to return. I know you will have beautiful photos for us to see. Have fun. Ah thanks for your kind words. Am planning on taking plenty of photos! I put some of my chilis in the freezer too – great in cooking. Mmm… I’m right there with you on Hot and Spicy!! And I definitely need to try your mum’s chili preserves! I can think of a ton of ideas to top that on!! Have a wonderful trip!! A fellow chili eater – and thanks for the good wishes! Oh dear, I hope you forgive the evil chilli soon…this comes from a woman who chopped a chilli once and then put her contact lenses in (only one, obviously as my eye was on fire)!! Great post on chilies Chica, and very helpful since my knowledge of chilies is ZERO!! Have a great holiday and have lots of fun!!! If I can do a post half as good as any of your travel posts I´ll be very happy! My mouth is watering. I love hot and spicy. So good. Enjoy your holiday! They really are very easy to grow (if you have the temperature) and look so pretty! Hope you’re having a wonderful vacation, Tanya! One more chili suggestion – jelly! Sweet AND hot, and great with cheese… I haven’t made it myself, but I’ve had some really good ones from some small local producers… I’ll scout around for a recipe. Having fun despite grey damp weather 😦 Love the idea of chili jelly – would love to give that a try! Ohh – fresh salsa with cilantro, sounds greats. I am a huge cilantro fan although my growing season didn´t last too long this year (not sure why). Will check out your recipe! Oh, these sound much to hot for me….I prefer paprika peppers rather than chillies, but I’m glad my pickling ideas helped! They did – very inspiring!! I love the heat of chilies, but I’m guilty of just using crushed red pepper and tabasco to spice things up! Nothing wrong with that! I grow mine because it´s hard to buy them here!